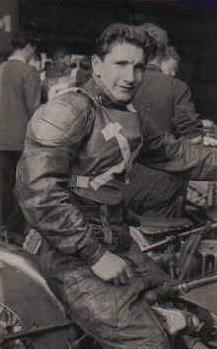 Reg Fearman, Test rider for England in the 1950s, team manager and Speedway promoter, now living in France, Reg rode predominately for the famous West Ham ' Hammers ' . He has been kind enough to share some of his memories with us on ' JustSolos'...Thanks Reg. 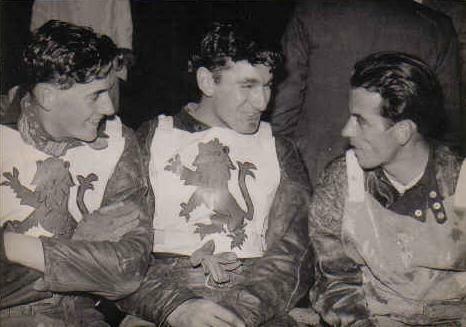 England vs Scotland - 1953 - Coventry - Johnnie Reason, Reg Fearman and Scotland's Ken McKinlay. 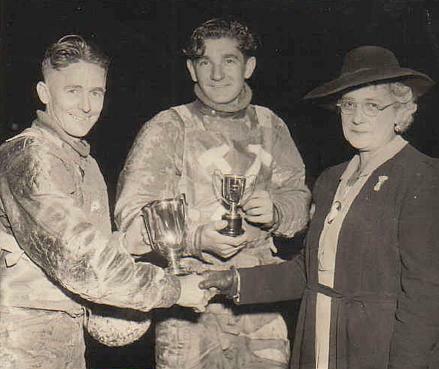 West Ham Speedway 1949, Mrs Conran presents the Senior and Junior Conran trophies to Aub Lawson and Reg Fearman. 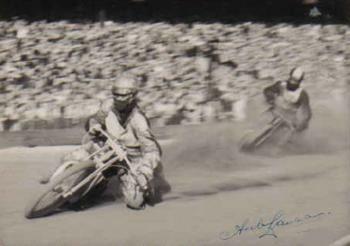 An autographed photo of Aub Lawson in action. 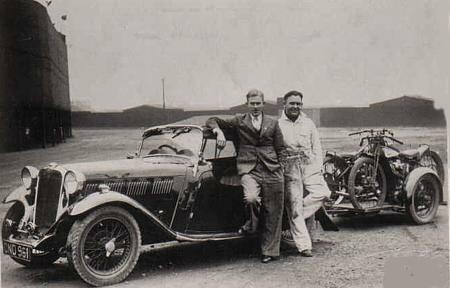 1937 - Alec Moseley, West Ham's chief mechanic, Arthur Atkinson and Eric Chitty. Aub Lawson and Max Grosskreutz of Australia. 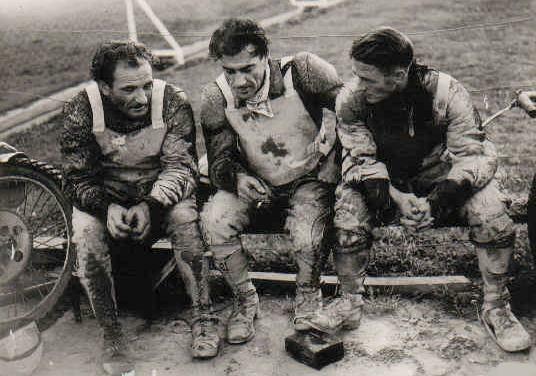 Vic Duggan, Lionel Van Praag and Aub Lawson - Australia vs England Test 1948. 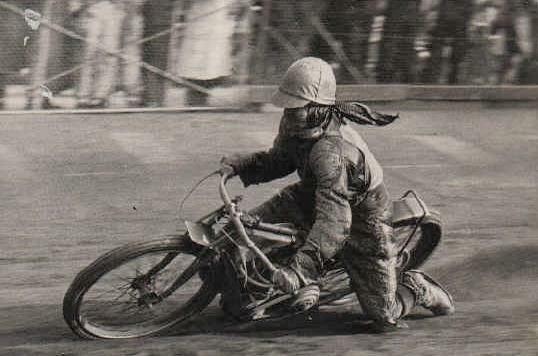 How a successful rider travelled with his bikes in the 1937. 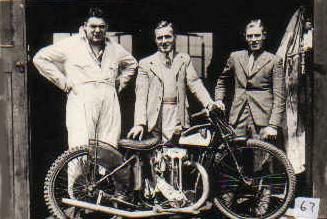 Canadian, Eric Chitty and mechanic. 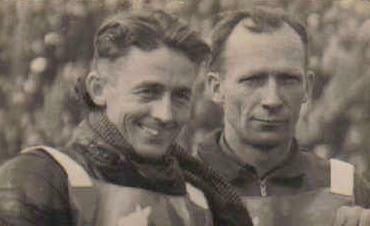 Great team riding by Arthur Bush and Nobby Stock of Harringay to hold out Reg and Howdy Byford - 1949. 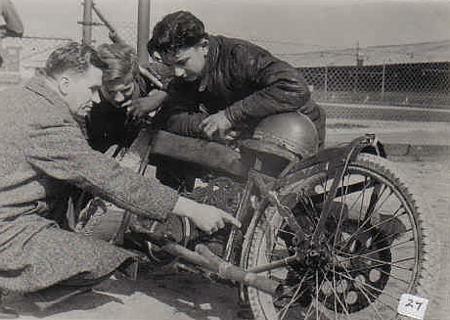 West Ham practice day 1948 and the legendary Harold 'Tiger' Stevenson points out some technical details to a young Reg on the 1928 Douglas of Aub Lawson. Aub loaned the bike to Reg for the practice day. 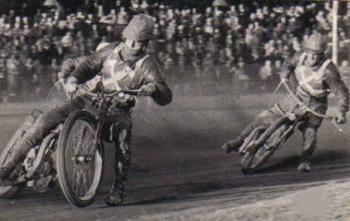 West Ham - 1950 and Reg leads Howdy Byford. 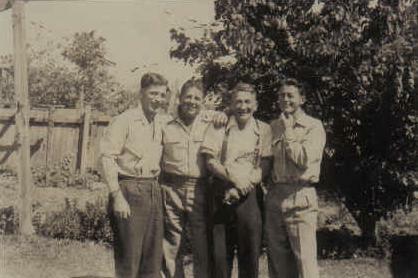 Peter White left, John Langfield, Peter Collins and Reg. 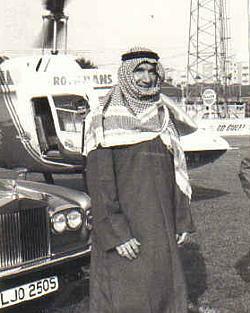 Reg at the start of the 1979 Middle East tour. Reg managing 8 of the best on offer . Great Britain vs Rest of the World. 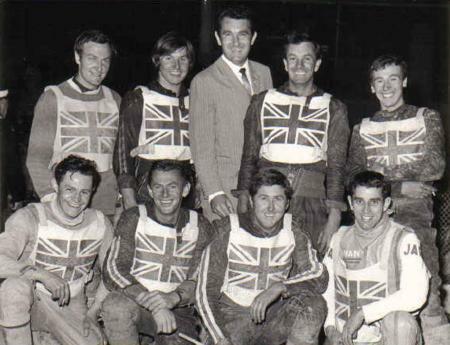 L to R: Back Row: Eric Boocock, Ray Wilson, Reg Fearman, Reg Luckhurst, Trevor Hedge. 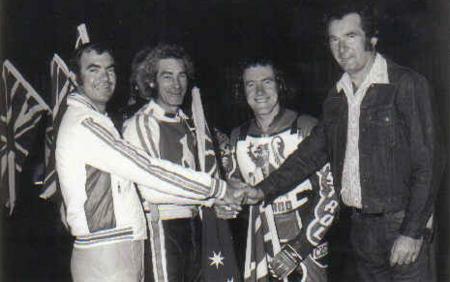 Front Row: Nigel Boocock, Ronnie Moore, Barry Briggs, Ivan Mauger. 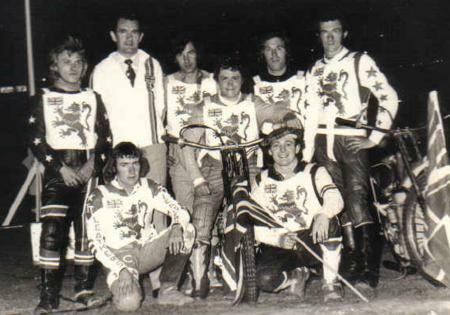 Reg Wilson, Reg Fearman, George Hunter,Nigel Boocock ( on bike ) Doug Wyer, Eric Broadbelt. The 1979 Cairo event was over two days. 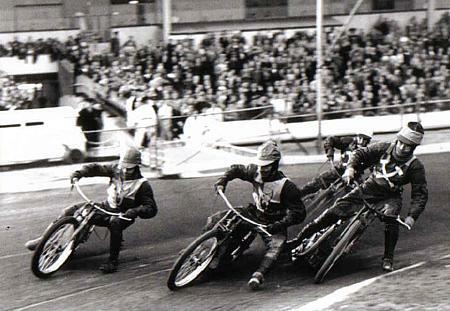 On the first day with 30,000 people inside the stadium and thousands locked out, many of the spectators at the end of the meeting climbed over the iron railings behind the speedway safety fence to mob the riders. At least one person impaled themselves on the spikes. The second day, the Riot Police were in full attendance with sticks, shields etc. 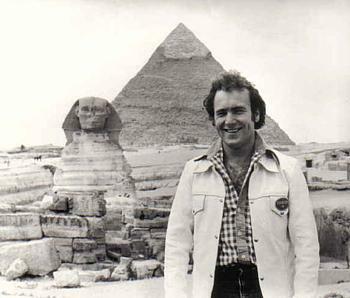 Cairo 1979 - Peter Collins and the Sphinx. 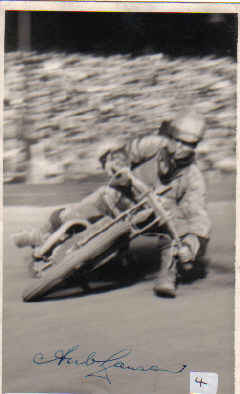 Thanks to Reg Fearman for an interesting assortment of photos. 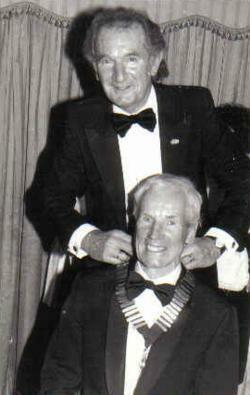 Reg says that the photo of Aub on the right was used as a model for a bronze that now rests on the grave of Aub Lawson at the Karakata Cemetery in Western Australia. 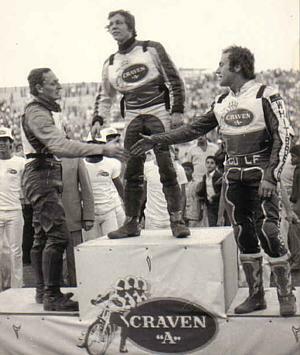 Chris Morton, winner in Cairo, Jim McMillan left and Peter Collins on the right.